Tina and Calecto V performed to an amazing mix of music (including Beyonce) at the 2014 Adequan Global Dressage Festival in March. Under the lights this American pair was by far my favourite. Whoever did her music deserves an award, it flows so well and the beats match Calecto’s rhythm perfectly. It has the right combination of voice and music that is in sync with the movements. I could watch this a thousand times and enjoy it everytime! The pair scored 77.975 and were second to Lars Peterson and Mariett. 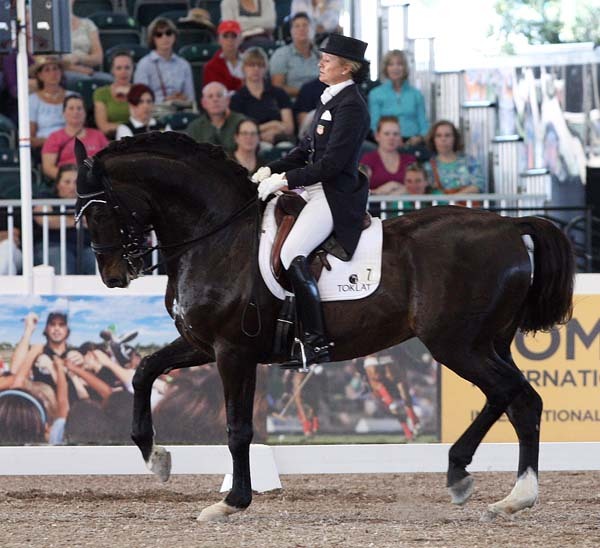 Watch her Freestyle at the 2014 Adequan Global Dressage Festival – USEF Network. ← Dressageholics everywhere are being exposed to… coloured and blinged out show coats! Gorgeous, aren’t they? I just found your blog and really like it. I’m looking forward to reading more.